As always, Mélomanie takes the audience to new horizons. 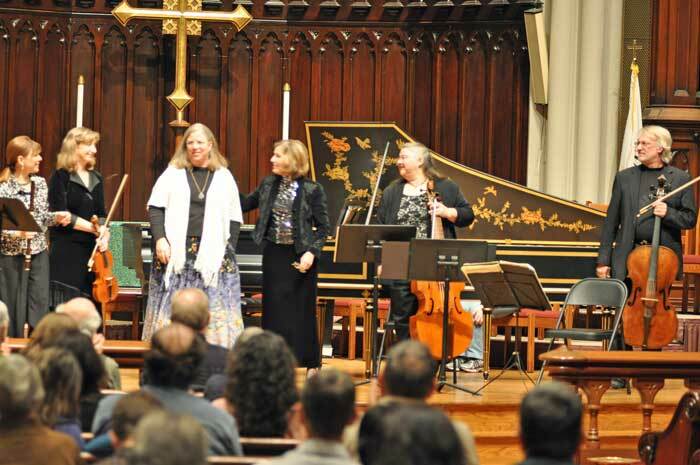 The ensemble’s winter concert included works by Louis-Gabriel Guillemain, Diane R. Jones, J.S. Bach and Bohuslav Martinů. The concert began with a lovely, airy quartet by the French composer, Louis-Gabriel Guillemain. Kimberly Reighly played the baroque flute, with Donna Fournier on viola da gamba and Douglas McNames on baroque cello and Tracy Richardson on harpsichord. Diane R. Jones described to the audience how she was inspired to write FireDance, commissioned by Mélomanie, as she sat outside her house, watching the fire at night. I realized how lucky we were to hear a composer talk about her work. So often we must delve into history books, hoping musicologists have understood the hearts and minds of composers. In writing the piece, Jones became fascinated with the idea of crafting a modern work for period (baroque) instruments. FireDance lives up to its name. The first movement, Sparks has short bursts of melody, with one instrument beginning and another taking over. Reighly (baroque flute) and Elizabeth Field (baroque violin) are so skilled at matching their tones that the melody flows effortlessly. The second movement Embers starts out with only strings. We can picture the fire being ignited, as instruments are added. Jones gestures to early music in the third movement, Flames. It begins with a violins solo, followed by sections of imitation and sequences-staples of baroque composition. Douglas McNames tackled Bach’s Suite in E flat minor. On a Landophi instrument (built in 1750), strung with steel strings, instead of gut, and resting on a modern endpin, he played with precision and passion. The Martinů Promenades for flute, violin and harpsichord is a jewel. Here, Elizabeth Field showed off some of her sweetest violin playing. The piece exploits the harpsichord’s nasal tones in a quirky way. Typical of many European composers from that period, Martinů drew on a rich store of folk music, infusing his works with colorful melodies and rhythms. Be sure to check out the release party for both Mélomanie’s and Mark Hagerty’s CDs at the Shipley Lofts in downtown Wilmington on Friday, February 4, from 5:30-8:00pm!